These words come with various translation possibilities. "'Enten' is extreme, windless heat under the direct rays of the sun." I can see sails in the offing under a blazing sun. Living near the shore, I often see white sails in the offing and carry them in my heart. The white sails in the offing under a blazing sun are real, while the white sails within my heart are not---the consonance of the real and the unreal. Depending on one's point of view, one might call this either a poem of youth, in which a young person expresses longing, or else a poem of maturity, in which an older person's sense of regret and isolation is projected onto a sail seen far off in the distance. The brief haiku form, rather than conveying its creator's real meaning openly, sometimes, as here, shows us a strangely beautiful world, beyond time, beyond thought. In actual fact, this poem was written on August 22, 1945, one week after the end of the war, while Seishi was convalescing from illness near the sea at Ise. "Down and out" would probably best describe the mood it was born from. In general, I kind of like "sweltering heat," which is how David Lanoue translates 'enten' for several of Issa's haiku. But "sweltering heat" implies a personal bodily feeling. In the context of Seihsi's haiku, in which something is being observed at a distance, I like Beichman's "blazing sun" best. Reading the explanations, I see these sails as plural. This temple is in memory of two haiku by Issa. There is a statue of a frog on a lotus leaf, reminding of the "yasegaeru" frog haiku by Issa. At this temple there is an "Issa Festival" held every year on November 23. A haiku contest for children is held. Nearby is the shrine Hachiman Taro Minamoto no Yoshiie, and the area was known as "Rokugatsu Mura" (June village), remembering the famous battle fought there in June. It was very hot during this battle, hence the name. into the sea of trees. Here the calligraphy seems more restrained and graceful than the previous tanzaku, but the freedom of the brushwork is at least as strong as before, if more subtle. 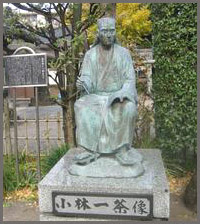 The single column of words is maintained within the center of the format as though the red paper were itself the blazing sunlight, withering the calligraphy as though it were Santoka's body in the heat. For example, the kana syllable shi is created with a single thin verticle line in the center of the tanzaku, but when the character kaze is written three graphs later, it opens the space as it might cool the pores of a sweaty body. For some viewers, it may seem odd to see a Santoka poem, with its simplicity of diction and plainness of speech, on a surface so highly decorated with fluid patterns of cut squares of gold leaf. However, the contrast may add to the effect of the calligraphy, just as it gives extra impact to the words of the haiku.
. . . . . end of Santoka haiku . . . . .
. Koya San in Wakayama 高野山 . Itaru Ina was born in San Francisco, Calif., on June 10, 1914. His father was an immigrant who worked for the local Japanese newspaper and his mother came to America as a picture bride.